Are electrics a bridging technology, and hydrogen fuel cells the future? “Both hybrid and EVs are merely bridging technologies on the way to the solution, which is hydrogen. The problem with EVs is a simple matter of chemistry – we won’t be able to get the charging times down. I’ve worked with batteries enough to know that fast-charging a battery is about the second worst thing you can do to it. There are two ways to abuse a battery: overheat it or fast charge it. With the Tesla Superchargers, they don’t publicise it, but if you ‘supercharge’ a Tesla, one supercharge takes 20 charge cycles off the end of that battery’s life. Two supercharges takes 40 charges. That’s simple chemistry; you can’t force the ions through the battery that fast without causing damage. Remarkable claims. 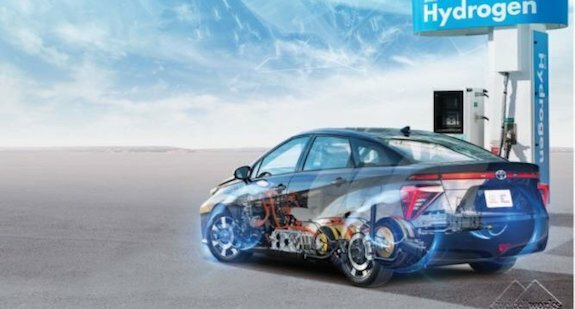 But it’s true that Toyota is doubling down on hydrogen — planning to drop diesel options from all its new models — and recently predicting that it will be able to produce a hydrogen-powered car at the same retail price as a hybrid, starting in the early 2020s, based on its ;next-generation hydrogen fuel cell tech. That breakthrough in vehicle costs is going to be needed, because the Toyota Mirai costs $57,000 in the US before subsidies and the kind of buy-in that will be achieved by those costs will keep hydrogen-infrastructure build-outs on the ‘low priority’ list for nations — especially those like the US, Canada, Australia=, Brazil, India, Russia and China with vast internal road systems. What’s out there now in hydrogen? The Mirai is the major player on the market now. The name means “Future” in Japanese — but it’s been available around the world since 2015 in small numbers. Just arriving now outside of Japan is the Honda Clarity (launched in the home country with the 2017 model year). 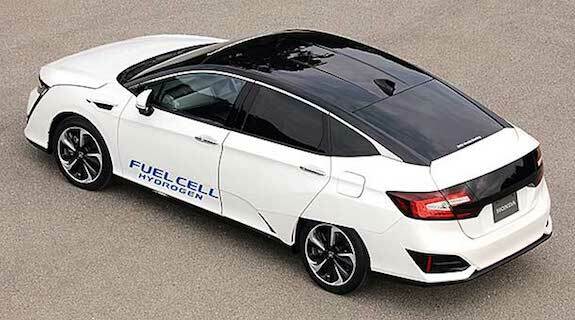 Very nice compact fuel cell system featuring 30 percent small stacks, meaning the entire fuel cell system fits under the hood, and the small car seats five comfortably, still generates 173 horsepower and has a range of 460 miles per fueling. And, for those in weather-prone areas, a bonus: you can hook your vehicle up to the house and use it as a back-up power generator, which will work for roughly seven days per fueling. Nice. Why the Hydrogen Hold up? Hydrogen? It’s been a casualty to a great extent of the drop in fossil fuel prices and crude’s stubborn “New Normal” at $50 per barrel. Just a few years back, sub-$2 per kilo costs for hydrogen looked like they would support a market — but consumers are buying lots of new cars and the rising SUV sales figures have been far outstripping climate-conscious EVs, and sales of hydrogen cars have just refused to take off. One major issue is refueling infrastructure, with 22 public hydrogen stations at last count and 19 of them in California. That’s the major reason that when the Honda Clarity launches in the US with a $60K price tag, it will be available only in selected California locales. 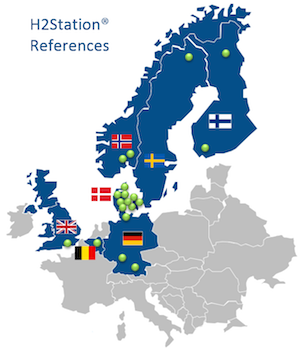 But it’s true that Europe is taking hydrogen a lot more seriously. Toyota is heading up a 13-company consortium under the brand “The Hydrogen Council”, whose members include Shell and Total. Back in 2014, in our continuing coverage of recent advances in cheap, affordable biobased hydrogen — meaning sub-$2 per kilo hydrogen gas — enough to light up the economics of fuel cell vehicles — we profiled a closely-followed yet slightly mysterious pyro company called Proton Power. This is hydrous pyrolysis, where they utilize some of the water to create the hydrogen. As company founder Sam Weaver noted, “And, our system is dynamic, we are pulling the gas away, and we get a different equilibrium (than other developers). Within automakers, says this Lux report, the strongest relationships formed are between Japan’s big three: Toyota, Honda, and Nissan. Toyota is not only at the central point of partnerships with other carmakers but also has alliances with heavy vehicles maker Hino, specialists like FirstElement Fuel, and industrial gas incumbents like Air Liquide. After Japan, it’s South Korea, where Hyundai has been investing heavily in hydrogen vehicles. In June, we reported that Nissan’s trials of its ethanol-powered solid oxide fuel cell vehicle showed promising results in its day-to-day testing undertaken during the past few months using hydrous ethanol in 6.6 gallon engines. The engine in the two vans used during the testing can also run on 50% water and is categorized as carbon neutral well-to-wheel. Using, ethanol and batteries, the vehicle has a 375-mile range. The e-NV200 electric vans used in the trial are made in Spain and then fitted especially with the electric engines. Nevertheless, we reported in August that Hawaii’s push for hydrogen got underway with groundbreaking for its first public fueling station for hydrogen vehicles located on Oahu. Hawaii plans on selling hydrogen fueled cars, like the latest Toyota Mirai, by next year and the fueling station should be completed by early 2018. 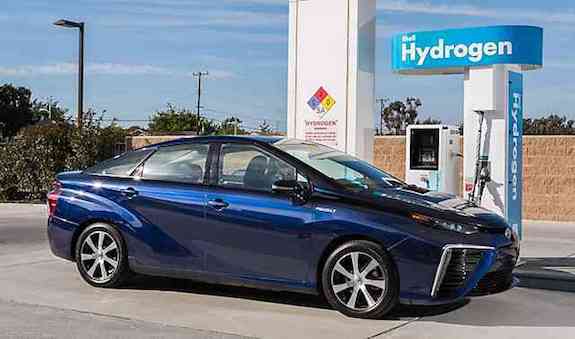 The Mirai has an estimated cost of $55,000 but can go about 312 miles before refueling and only takes a few minutes to refuel using electrolyzed water that splits into hydrogen and water. To sweeten the deal, Servco Pacific is looking into offering Mirai car owners with free fuel for three years. The only emissions from driving the hydrogen car? Water. Servco Pacific is handling the construction and Toyota is collaborating to get hydrogen vehicles to Hawaii. While the exact fueling station cost was not disclosed, Servco Pacific said they are not using any grants or public funding for the multi-million-dollar project. In June we reported that the U.S. Department of Energy announced approximately $15.8 million for 30 new projects aimed at discovery and development of novel, low-cost materials necessary for hydrogen production and storage and for fuel cells onboard light-duty vehicles. Selected projects will leverage national lab consortia launched under DOE’s Energy Materials Network (EMN) this past year, in support of DOE’s materials research and advanced manufacturing priorities. There are 72 concept and prototype vehicles that have been developed to date, according to HydrogenCarsNow.com — from Audi, BMW, GM, Chrysler, Ford/Mazda, Honda, Hyundai, Kia, Mercedes, Mitsubishi, Nissan, Peugeot, Renault, Suzuki, Toyota and VW. In May we reported that “electrical” bacteria are the key ingredient in a new process developed by the Department of Energy’s Oak Ridge National Laboratory that recycles wastewater from biofuel production to generate hydrogen. The hydrogen can then be used to convert bio-oil into higher grade liquid fuels such as gasoline or diesel. The team’s lab-scale demonstration can produce 11.7 liters of hydrogen per day at rates that are required for industrial applications. The hydrogen generated from the microbes could displace the need for natural gas, which is used later in the production process to upgrade bio-oil into more desirable drop-in liquid fuels.